Renewable energy, solar energy, clean technology – these words were a part of our dictionary since our school days. We simply read about them, wondered why we don’t use them; and carried on with our lives. No fuss, no extra thought. However, some people gave it more than a thought; they took the idea and decided to take it to millions of people who were still devoid of the basic lighting, forget about not CFLs and LEDs! Yes, such a world exists in India where light even today comes from sooty kerosene lamps. Around 37% of Indian households use kerosene for lighting and heating and 2.2 billion liters of kerosene are used every year. Obviously, the impact on people’s health and environment is enormous. Considering this appalling situation, The Energy & Resources Institute (TERI) took up the challenge of providing clean sustainable lighting solution to the unelectrified remote rural areas of India. TERI initiated a project called “Lighting a Million lives” in 2008, which later due to its success and impact, became the Lighting a Billion Lives (LaBL). The primary aim was to provide solar powered lanterns to underprivileged households, where kerosene was the only dependable source of power. TERI chose the poorest of the villages in neglected corners of the country, so the access routes to each of them was a challenge in itself. Established in 2008 with a team of 30 people, TERI teams would cross lakes and climb hills to reach their destination. Particularly, during the Monsoons, these villages would be cut off completely for stretch of 3-4 months. Under these conditions, it was herculean effort for the team to reach each village and ensure that. The business model that TERI chose for the LaBL project is quite interesting. The project operates on a fee-for-service model where centralized solar charging stations (SCS) are set up in villages for charging the lanterns and providing them on a daily rent basis to households and enterprises. The charging station is typically installed by the technical partners of LaBL and run by entrepreneurs/self-help groups who qualify the selection criteria. The TERI team selected the village in need and the group of households based on a set of stipulated guidelines. Each village was chosen only if it fitted the requirements of TERI, which included selecting a partnering NGO working in that area. Consider a village where 10 households decide to get solar lanterns for their home. They would connect with an entrepreneur from the village who would take charge of the chargers and get a part of the maintenance fee, which would give him a livelihood. The villagers would take their solar lanterns to charge by the day and enjoy the clean light at night. The cycle would continue everyday, eliminating health and environmental hazards from the usage of kerosene. The interesting part here is that the villagers do not get this as a charity. The villagers pay fees as per their capacity ranging from INR10 to INR300 per month. Profit was not the motive; it was the process of making the villagers a stakeholder. This is the motivating factor for them. The LaBL team further trained a village technician – anyone with technical skills – to become “Energy Entrepreneur”. These Energy Entrepreneurs take care of minor repairs of the lamps; they propagate the project around the village and in essence take the responsibility of sustaining the project on its own. As the villagers get a hang of the deal, LaBL withdraws from the village, leaving the partnering NGO and villagers to manage it themselves. 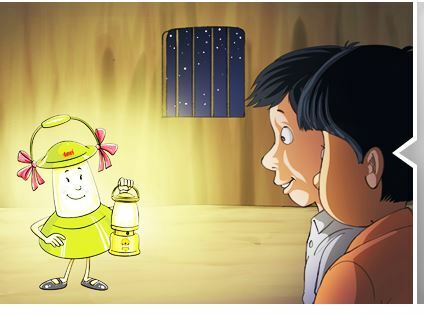 Laltini – the cute mascot of LaBL brings home the point that solar lamps are as good as tiny beacons of light in your home. One cannot help but smile at the happy little lantern, which very well connects with the villagers emotionally. The LaBL team shares their experience of witnessing childbirths in their solar lanterns, along with happy 70 year olds exclaiming that their dream of having light at home is fulfilled. Behind the success of ensuring these smiles, TERI’s LaBL teams are meticulous in their approach to the project. No compromise is made in terms of the lamp specifications or the solar panels. Wielding considerable influence, TERI instructs the suppliers to manufacture the lamps as per specifications stipulated in TERI research labs. The sharpness, brightness and the color temperature of the lamps are pre decided. Villagers apparently love the yellow shade and hence Laltini is a happy yellow lamp! The LaBL team has plans to install sensors in the lamps, which indicates the lamp has been not used for 2-3 consecutive days. They have now moved to installing micro grids for shop owners, which is leading to overall clean energy everywhere. TERI’s LaBL team are working as the quintessential social entrepreneurs, who saw the need, understood the technology and added the social impact to the mixture to create a beautiful model of sustainable clean source of energy, which reached over 2,596 villages across the country, illuminating 513,444 households. In a country with millions without electricity, a group of just 30 people took this to their heart and set out to right the wrong. Till now, 2,557,218 lives have been touched and I hope the billion comes up soon! This is a brilliant idea and a job well done! Kudos to the team behind this. Excellent Job in writing this clear to the point article on an awesome project.